. . .ersatz écrivailler, griffonner, and rédiger since 1981. I’ve mentioned recently (and elsewhere) that I’ve been dealing with a lot of chronic health issues. They are pretty much a void in which all of my time and energy have been getting slowly sucked away. My health has caused me to miss more work than I have in the last six months than the past six years combined. They’ve caused near paralysis with my writing and have prevented me from even leaving the house much. It feels like there is not a lot I can do but write about them as I make my stand. I’m 32-years-old, but you’d never guess if you saw my medical chart. I’ve got an arthritic back, severe ulcerative colitis (UC), IBS, acid reflux, lactose intolerance, Celiac Disease, a tree nut allergy, allergies to most things that grow on trees (including most trees, themselves), generalized anxiety disorder, clinical depression, extreme ADD, and insomnia. 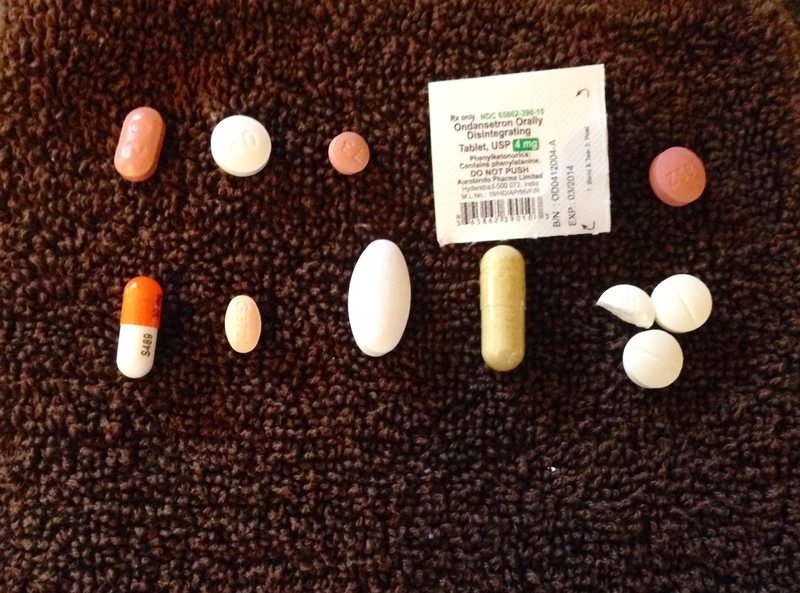 The picture above is the minimum number of pills I have to take on any given day. The problem(s) lie in that the treatment of some of these issues results in complications with others. Around the end of September of 2013, my UC began to flare up again. It progressively got worse despite the treatment I’d undergone since my diagnosis. My gastroenterologist prescribed more powerful mesalamine drugs (Lialda, Asacol, and Apriso), but each of them failed to work to expectations and came with an alarming side effect of their own: severe chest pains. The doctors had me stop taking the mesalamine because in some cases, it can cause pericarditis, a condition in which the sac-like covering around the heart (pericardium) becomes inflamed. A Batch of S[h]elfies Part 3: Bonus Edition! My Writing Process Blog Tour: Bro, Do You Even Write? !